I think the world of sports is one giant metaphor for life’s journey. I ran my first half marathon this past weekend, and I was struck by lots of metaphors throughout the race. It was a journey, it was a battle, and it was a party – all in one. It was a great experience. I met my pace goal, I had some wonderful people to share my accomplishment with, and, most importantly, I learned a lot about myself during my training and on race day. No one can do it but you. Your legs, your hammering heart, your mind, and your muscles have to get you across that finish line. No one can do it for you. In this life, the race is yours alone. I can’t borrow anyone else’s talent or muscles, however hard I might try. The truth is that I have been designed with all the equipment I need to finish – and finish well. So have you. Sometimes, you run alone. And that’s okay. I signed up for my race totally independently, and I spent much of the race running by myself. But that made the end goal that much sweeter! I have a whole new confidence that stems from pushing myself. If I can endure that, I know can endure many challenges to come. And if I think about it, I was never truly alone. I had a big community of runners and spectators around me the whole way. Sometimes, you need other people. And that’s okay too. Toward the end of the race, I was really starting to ache. My stomach was upset and my muscles were whining. To keep myself going, I kept an eye on this girl in a pink shirt who was running near me. “Just keep up with her,” I thought to myself, to hold myself accountable for my pace. So she and I ran in tandem for a while. And then, around mile 10, she suddenly tapped me on the shoulder and said, “Hey, we should finish together. We’ve been pacing together for a while now. Let’s keep each other going to the end.” I grinned at this complete stranger. “Yes! Let’s!” I said. And gosh, you guys – I totally needed her at the end. I totally would have slacked off if I hadn’t felt compelled to stay with her. We plunged across the finish line at the same time and gave each other adrenaline-filled high-fives and congratulations. In this life, we are also designed to need each other – to help each other through. And man, I am glad for that. It helps to have fun along the way. 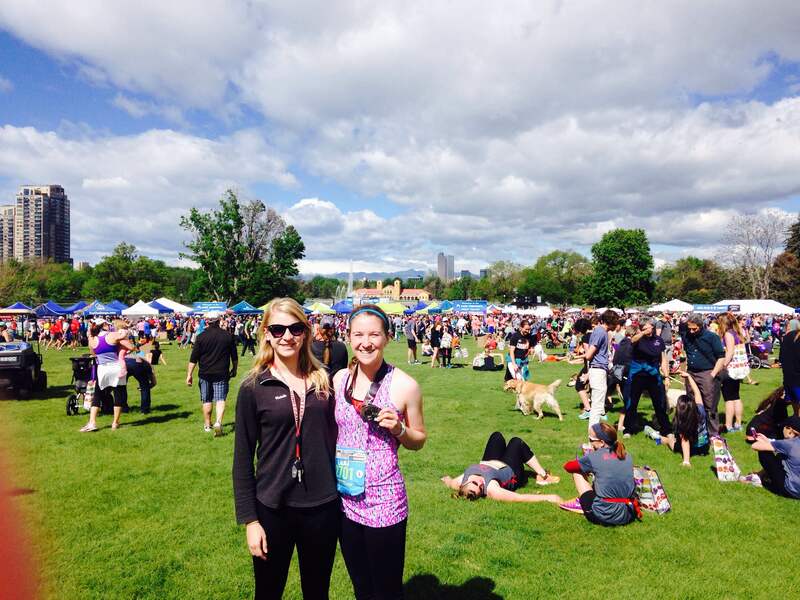 Like I mentioned before, the Colfax Marathon series had a ton of fun perks that made the race enjoyable. We ran through the zoo, and pointed giddily to the elephants and the flamingos and the monkeys as we passed. Everyone around me was grinning through that part of the course – and many people tried to take cell phone pictures, which was hilarious to watch. At mile 8, we got to run through a fire station, where several hunky firefighters were there to give us high-fives. That also got us grinning! Plus, throughout the course, there were bands playing, families holding signs, volunteers cheering and local residents sitting on their front lawns giving us kudos. Several gospel choirs were stationed out in front of their churches on Montview Boulevard and sang us hymns as we passed. It was awesome! That encouragement really reminded me to enjoy the experience. Laughter and celebration are necessary, I think. When you’re in pain, it’s harder to see the good stuff. In the final mile of the race, we made our way back to City Park where we had started. We ran right past the beautiful City Park fountain and the lake around it. This is one of the best views in Denver! The water, the historic boat house, and the downtown skyline in the background make for a perfect picture. But when I was running, I didn’t really see it because I was hurting. My heart rate was super high and my stomach wanted to get rid of the Gatorade I had slammed at mile 6 and mile 10. So, instead of soaking up the scenery, I powered through, as you sometimes do in hard seasons of life. When you’re hurting inwardly, it’s hard to see the beauty around you. That’s a challenge worth taking though. I want to be observant and joyful even in the tough moments. When you get to the finish, there are certain people that you want to be with you. When I finished, I wanted nothing more than to see my mom, dad and sister. I also kinda wished that all my best friends – though they are scattered across the country – could have been there right in that moment to just do a little victory dance with me. When I get to the finish line of life, I’m gonna want these same exact people to be dancing with me then. You need core people in your life. The people that help you train, keep you motivated, and love you the best. Recently, I heard a triathlete say that, in order to push herself through a difficult race, she chose to think about a different person for each mile of the course. She thought about her mom for one mile, her best friend for mile 2, her son for mile 8, and so on. I love that! Finally, eat your veggies. I met up with some friends after the race, and they had just finished doing the marathon relay with a team of six. We were wandering around the post-race expo when we discovered that the race’s sponsor was handing out free fruits and vegetables for racers to take home. Honest to goodness – the line for produce was almost as long as the line for free beer! Haha! That’s Colorado for you. So we loaded up on corn and asparagus and apples and onions (see our enthusiastic photo below). I guess the overall takeaway is to enjoy the rewards that come with your accomplishments – and give kudos to your friends who are also accomplishing big things in their lives, too. A big thank you to everyone who’s been a cheerleader for me in running and in this past year of my life in general. This weekend’s race represented the fulfillment of a longtime goal and it was a real boost of confidence and hope for me. You guys are the BEST. Here’s to running well – on the race course, and in all of life. Previous Post Small, but Mighty.